Prices are for tubs of 50 tablets. 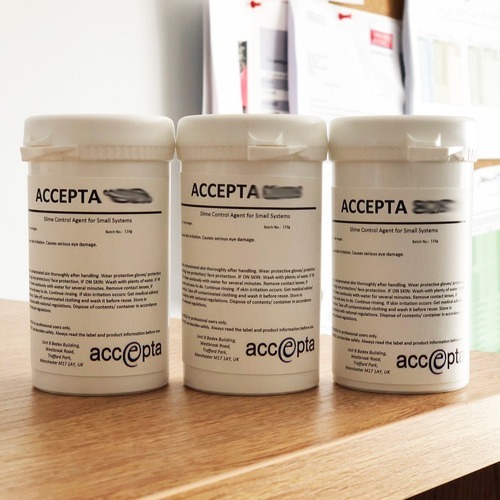 Accepta 8208 comprises a high performance, slow dissolving tablet based biocide scientifically formulated for the treatment of air conditioning systems, humidifiers, water tanks and water features. Accepta 8208 is a tablet biocide that is scientifically formulated to provide the long lasting control of slime forming bacteria, sludge and other biological growths in HVAC systems, air conditioning condensate pans, ducted systems, humidifiers, drain lines, water tanks, gullies, decorative water features and more. Giving superior results where high performance is essential, Accepta 8208 is extremely safe to use; the tablets are non-corrosive and as they are totally soluble, they leave no residue. Air conditioning is utilised in many buildings throughout the world to ensure the provision of pleasant, healthy working environments. One important area of the air handling system often forgotten until problems occur is the condensate collection pan associated with small de-humidification units. Stagnant condensate, accumulating in the pan, provides an ideal habitat for various bacteria, which multiply rapidly forming odorous biological slimes. As growth continues drain lines become blocked and the resulting overflow can cause considerable damage to the structure and furnishings, apart from the obvious inconvenience to staff and guests. These biocide tablets can be used as part of a planned maintenance programme within industrial, commercial and medical establishments, hotels, public and private buildings that utilise air handling units. The products broad biological biocidal action ensures condensate pans, ducted systems, drain lines, tanks, gullies etc. remain clean and clear. This versatile product, which requires no specialized doing equipment, is easy to use and store, controls odours and is ideal for small volume systems. One tablet of Accepta 8208 will treat up to 100 litres of water and will last up to one month. For larger systems multiple tablets may be used, and in long or complex systems the tablets can be staggered along the length of the line wherever is accessible. Accepta product specialists can advise on the ideal dosage levels and testing regime for individual systems.